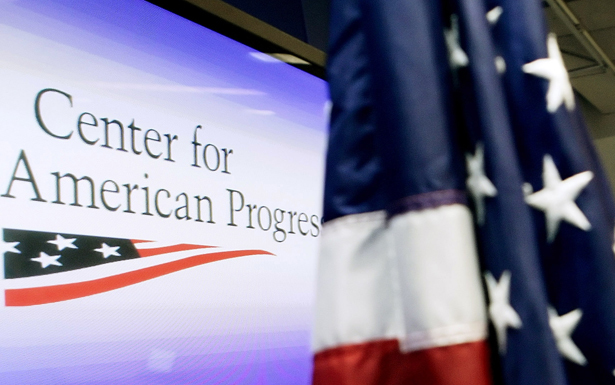 My piece here last Tuesday about secret donors to the Center for American Progress and other think tanks generated a lot of interest and debate. I also heard from many readers who passed along stories and documents, including a 2012 list of members of CAP’s “Business Alliance” corporate donor program [PDF]. Note on the second page of the document that donors are helpfully arranged by industry—“As listed by the Fortune 500,” the document says. As I stated in the piece, CAP will not comment about its donors, and spokesperson Andrea Purse had refused to confirm or deny the names of Business Alliance members on three previous lists I had obtained, all from 2011. The lists were maintained by Chris Belisle, who CAP described as a “junior staffer” in its letter of reply to The Nation. When reporting the original story I sent Purse one of the 2011 lists, which she said contained dozens of errors (despite there only being a few dozen names on it), while failing to specify which names were incorrect. I was able to confirm more than a dozen names by calling the companies on the list, going through their foundation reports or obtaining independent confirmation. The lists were sent internally to staffers so they would know to be careful when writing about companies that financially supported the think tank, sources told me. Numerous corporations appear on all four lists. They include Abbott Laboratories, Amgen, Bank of America, Carefirst Blue Cross Blue Shield, Citigroup, Eli Lilly, General Dynamics, Kohlberg Kravis Roberts, Pfizer, The Carlyle Group and Verizon. I also asked if CAP felt that taking secret donations from corporate donors neutered its ability to address the issue of campaign finance reform, and if it believed that money in politics was a serious problem. I asked as well if CAP would consider changing its policy of taking money without disclosure from corporate donors. In response to my questions about campaign finance, Purse said, “Our work shows that we believe campaign finance reform is a vital issue for our democracy and an issue which merits serious attention,” pointing to CAP’s coverage of the issue, through reports and ThinkProgress blog posts. CAP has similarly cited all the ways in which it has been critical of its (otherwise unacknowledged) corporate donors as proof that they do not influence its policy agenda. CAP has pointed to many ThinkProgress posts going after Goldman Sachs, for example. But this argument obscures the indirect way influence is usually exerted. In most cases, a donor’s gift is not understood by either party as buying complete loyalty to its cause. As I note in my reply to CAP’s letter to the editor in The Nation, Wall Street companies gave a lot of money to President Obama not because they expected to get his support all the time but to get it more than they would if they didn’t give him money at all. A similar dynamic appears to be at work at CAP and other think tanks. And in fact, there is evidence that CAP’s interest in wooing and pleasing corporate donors has shaped coverage—beyond what I included in my original piece. Multiple former staffers told me of editorial intrusion by senior think tank officials, in cases that included Saudi Arabia, when CAP was seeking Saudi support. CAP pitched the Saudis for funding sometime after Tanden took over as president in 2011, I was told. Two people said to be involved in the pitch were Ken Gude, Tanden’s deputy, and Rudy deLeon, a former Boeing lobbyist and now CAP’s senior vice president for national security and international policy. (Boeing, of course, is a major supplier of weapons and commercial aircraft to the kingdom.) While the pitch was in play, some staffers were told to avoid criticism of the kingdom, sources said. It was not clear if the think tank was seeking money from the Saudi embassy directly or from a Saudi company or other cutout. In response to my questions about this, Purse did not deny that CAP was seeking Saudi money. She said, “We have not received any money from the Saudi government, Saudi companies or any associated interests. We have not and will not allow corporations or others to censor our work as any examination of our extensive record of reports, columns and posts clearly shows.” Again, citations of critical coverage were offered to demonstrate an absence of influence; but, while it is true that CAP has run tough pieces on the Saudis and on some of its donors, the question remains whether that coverage would have been different had the pursuit of donations not been a factor or if the pitch had been successful. Incidentally, my numerous sources all gave very good reasons for speaking off the record. I provided their names and notes of our conversations to my editor at The Nation. Some of them are disillusioned with CAP while others still view it with affection, but with one exception, they were all troubled by the think tank’s relationship with its donors. In its letter to The Nation, CAP said that it currently receives 6 percent of its budget from corporate contributions and that figure has never hit double digits. Even if the 6 percent figure is accurate—and we have only CAP’s word to take for it, since unlike most major think tanks, it doesn’t publish or make available an annual report or otherwise disclose at least basic financial data—it’s impossible to know its true significance given CAP’s refusal to provide other information. In a story in March, The Huffington Post reported that CAP pulled in “nearly $20 million from philanthropic groups in 2012, more than half of its funding base.” The story said that while CAP does not publicly disclose its donors, “the fundraising numbers were provided to HuffPost by a CAP source and confirmed by Tanden.” So again we only have CAP’s word to go on as opposed to a financial report, but even if what they say is true, a few obvious questions arise, which are unanswerable because of the think tank’s lack of transparency. * Will CAP provide a full list of foundations whose support it receives? Is CAP including corporate foundations in this category? * If 6 percent of the budget comes from corporations, and “over half” comes from foundations, that presumably means that somewhere around 40 percent comes from individuals. Who are they? Do any of them have ties to major corporations? It’s not complicated. CAP should disclose its donors, corporate and otherwise. At an Obama fundraiser, twelve undocumented immigrants and allies were arrested for protesting record deportations. Read Aura Bogado’s report.